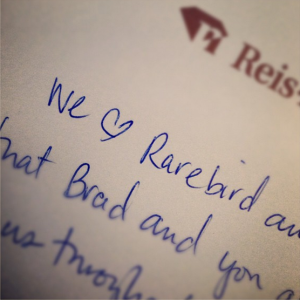 I’M THANKFUL THAT PEOPLE FEEL THIS WAY ABOUT THE TEAM AT @RAREBIRDINC. THANKS @REISNICHOLS! Success is a funny (and often fleeting) thing. One day, you’re on top of the world, the next you’re tumbling into an abyss. Or, on a smaller scale, one minute you feel great, and the next — just one phone call — can have you wallowing in self-pity. But is success really so fleeting, and should our emotions be so delicately tied to outside influence? I think not. I really, really hope you see your own attitude in the first paragraph and not the second. But if your gratitude exercise plan needs a bit of work, James has some thoughts on that, too. This is outstanding advice. Just before I lay my head on my pillow tonight, this will be one of the things that I record being grateful for. Thanks, Geoffrey James, this is a reminder I needed to hear. The recent tornado outbreak in southern Indiana was a tragedy in every sense and we may feel the effects long after the clean up is complete. The photos and videos are shocking and the stories are very sad. But, like always, Hoosiers rise to challenge in every way. Donations and support moved in quickly to help alleviate the suffering. Gov. Daniels has requested federal disaster aid to help rebuild. They don’t need clothing or household items at this point, but the Red Cross is encouraging people who want to help to make a financial donation. You can help those affected by disasters like the Midwest tornadoes and storms, as well as countless crises at home and around the world, by making a donation to support American Red Cross Disaster Relief. Consider making a donation today by visiting www.redcross.org, calling 1-800-RED CROSS (1-800-733-2767) or texting the word REDCROSS to 90999 to make a $10 donation. Your help enables the Red Cross to prepare for and provide shelter, food, emotional support and other assistance in response to disasters. Unfortunately, even after the initial shock wears off and the rebuilding is complete, the financial impact on the communities will linger. I haven’t seen any statistics, but I’m wondering how many businesses will be shuttered due to an inability to recover from lost time, inadequate resources, or disruption in vital services. History shows that even minor disruptions can damage a business indelibly: more than 85% of businesses that suffer an unplanned outage don’t survive. While we will never be able to foresee disasters, both big and small, we can anticipate and plan for them. There are great resources available online to help you devise a disaster recovery/business continuity plan for your business. Try reading this Wikipedia article for an overview of the topic. You can also get a free trial of an online software product to help you create your own plan from Survivor or Statistic. This is one of those things that never seems to be the highest priority, but it can truly be the difference in the survival of a business. If you own or run a business, you really need to look into putting a plan together soon. Silence speaks volumes. Are you listening? Sabina Nawaz wrote a post today about setting aside time for silence to allow ideas to emerge and new concepts to form. I don’t think I could agree more. This frenetic pace we’re all on to do more with (seemingly) less time has caused a crises of sorts. If we’re surrounded by even 30 seconds of silence, many of us will reach for our iPhones to check email. Frequently they tell me about the sacrifices they’ve made for their work: how they’ve slept only three hours the night before, haven’t exercised in months, missed their children’s games. They’re busy because their work is important. They operate under tight timelines and competitive pressures. The stakes are high. In response, she suggest they try something counter-intuitive: Do less. She recalls John Cage‘s seminal piece 4’33”, which consists of exactly four minutes and thirty-three seconds of silence. I don’t know if you’ve heard it, but you might find it difficult to sit still that long. When the BBC aired the performance, they had to turn off their emergency systems that are designed to automatically fill silence with music. I suspect that your emergency systems would kick in almost as quickly as the radio stations. But silence is exactly what all of us need more of. For me, I’ve turned off the radio in the car. I often ride without headphones. The hour I spend in Adoration each week is perhaps the most perfect silence I’ve found. You may find it differently… you may also find that anytime you sit quietly for four minutes you fall asleep, which is really telling you something else entirely.